Originally developed for our polished engines, the superior quality and dimensional precision of these tappet guides makes them a great upgrade to both stock and modified engines.Fits: 1984-'99 S&S® V-Series engines and Special Application crankcases with .250 offset cam chest. Billet chrome tappet guide set. S&S® engines for 1984-’99 chassis with larger than 3 13/16" bores are typically built using special crankcases such as S&S Special Application cases which have an offset right side gear cavity for more tappet guide to cylinder clearance. 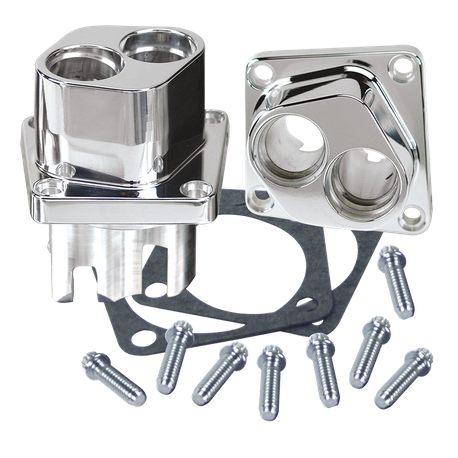 S&S offers special tappet guides machined to compensate for the change in pushrod angle caused by the cam chest offset of these cases.